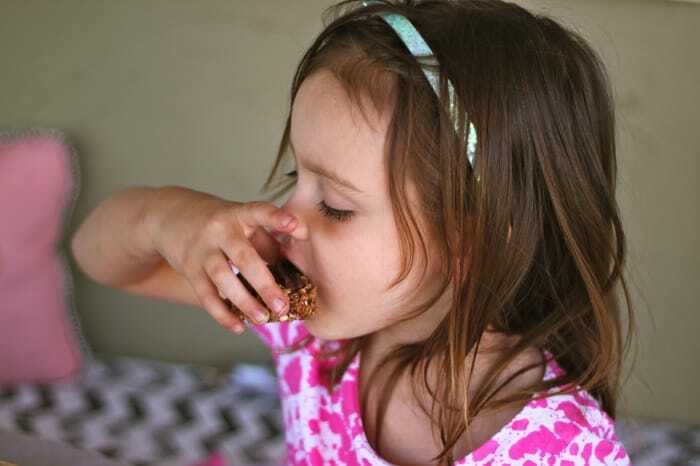 I’m gonna tell you the mega-easy, no-bake, extra-yum basic formula to make your own super-tasty granola bars with your kids from whatever you have lying around your pantry. You’re going to have so much fun. 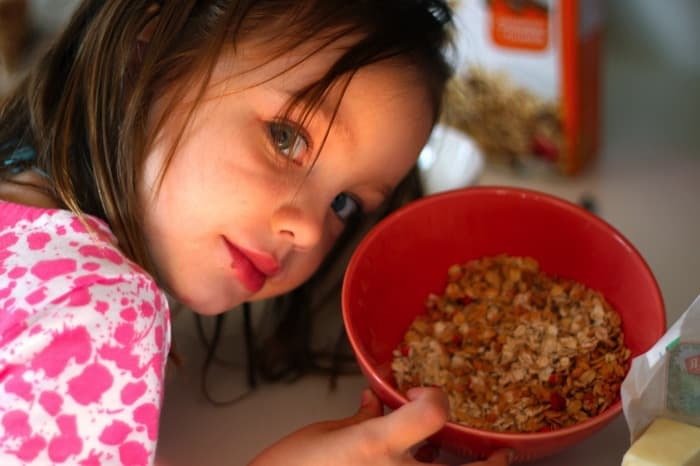 So join hands with your minis and start rifling through the cabinets for all those almost-finished boxes of cereal and bags of nuts. 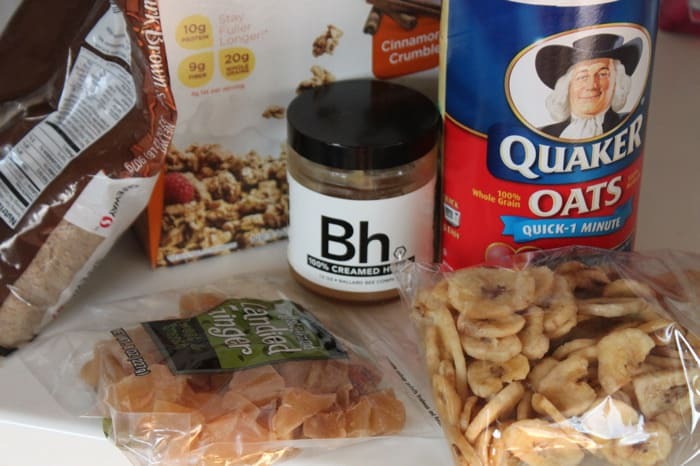 Gather a bunch of stuff that might taste good together and pile it all on the counter. Whatever you have, it doesn’t matter. 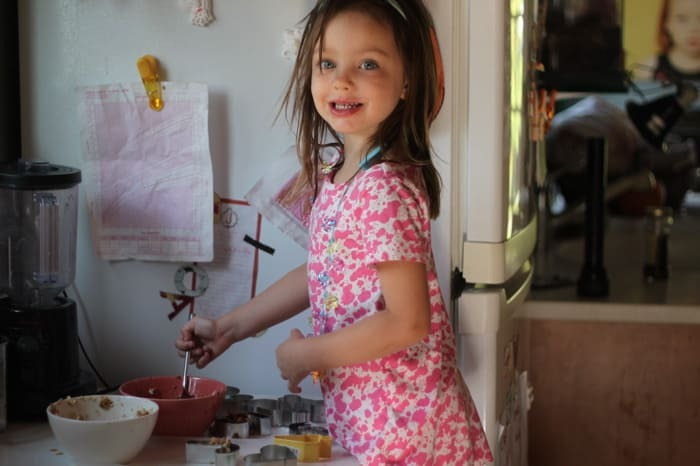 I will show you how to make the “glue” to stick all your ingredients together. 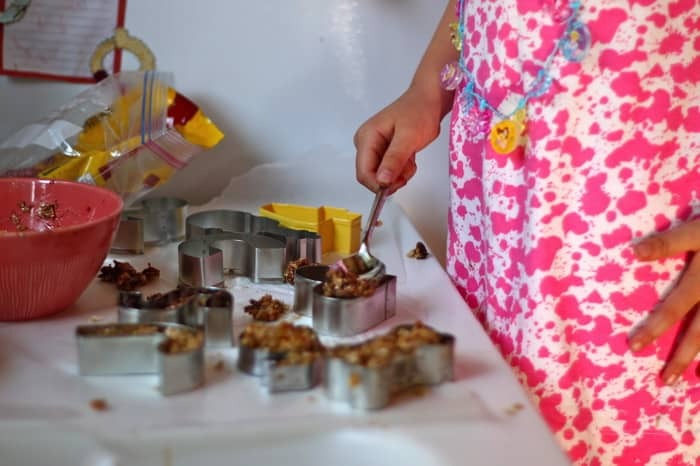 Your kids will get super creative making their own “scrap-busting” granola bars. The only rule is ya’ gotta eat what you concoct. At least, that is how I keep my daughter from adding cat food. 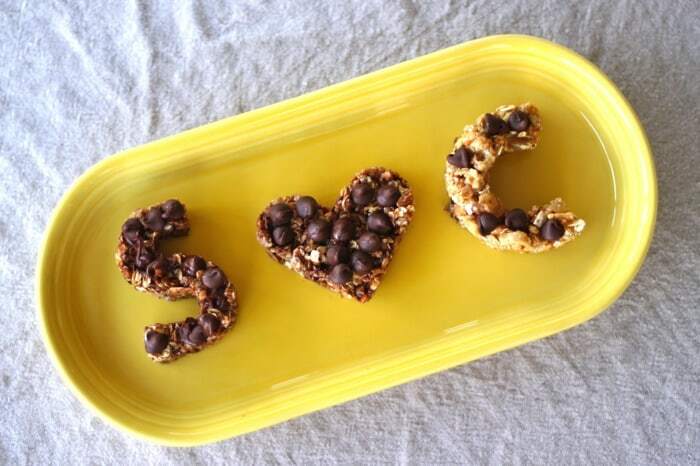 You can quite easily make yourself some simple and delicious granola bars (hello, boring), but my child likes to do crafty things and I like to watch her do crafty things, so she made them shaped like letters and hearts and dog bones so she could take fun shapes to school in her lunch. She also likes to call them “Kabobos,” but I have no idea what that means. Gather some goodies. I usually set out a few bowls and we mix different concoctions in each. I am obsessed with Kashi Go Lean Crisp cereal (thanks Clare), which tastes all cinnamony-delicious and is complemented by some spicy candied ginger among other things. 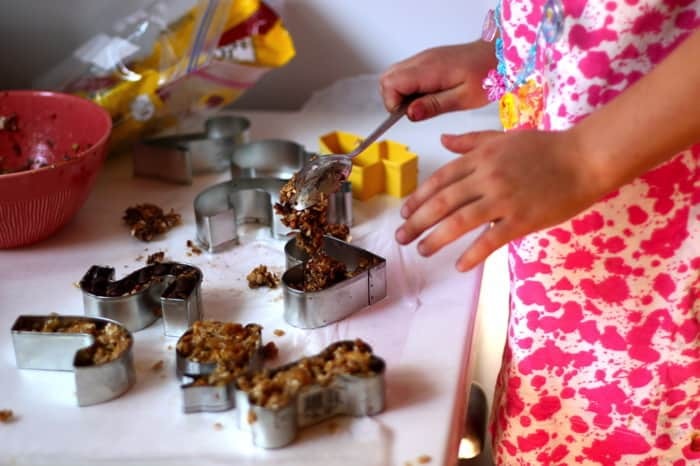 This time we threw in some candied walnuts from christmas that I found hiding in the back of the cabinet in a crumpled ziploc. 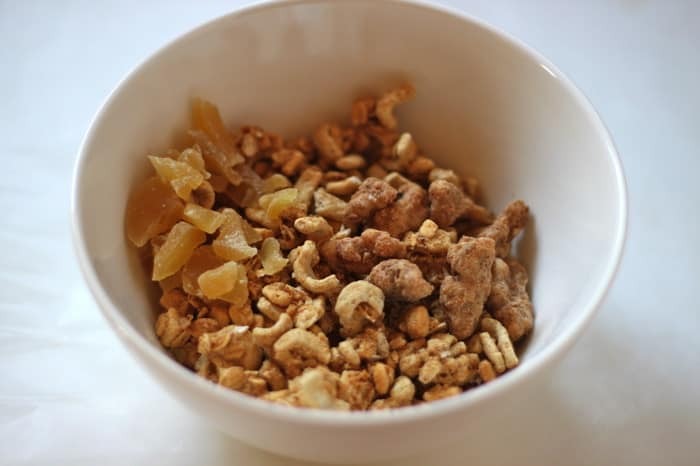 Quick cook oats, any kind of nuts, and dried fruits are always good combos. 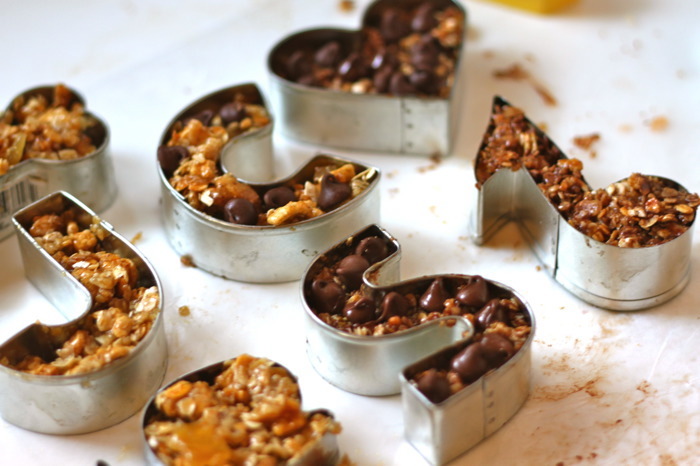 Or you could use, umm, granola. 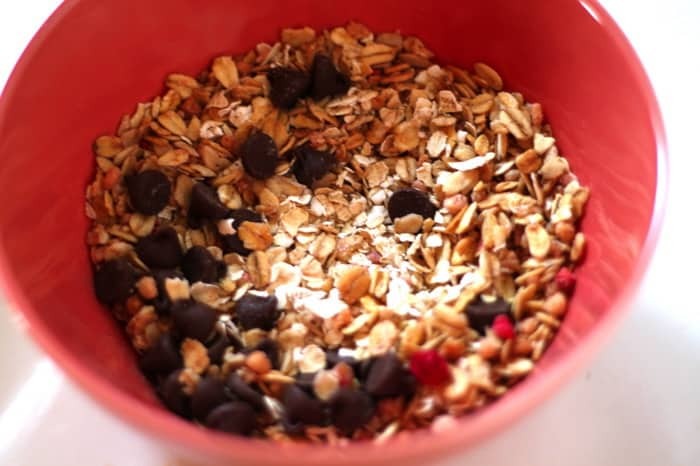 If you mix chocolate chips into your bowl, they will melt and make everything a little chocolatey. If you want chocolate chips whole, save them until the end. Let them experiment. Gorilla Munch is kinda tasty in a scrap-busting bar, I’m not gonna lie, I love gorilla munch. 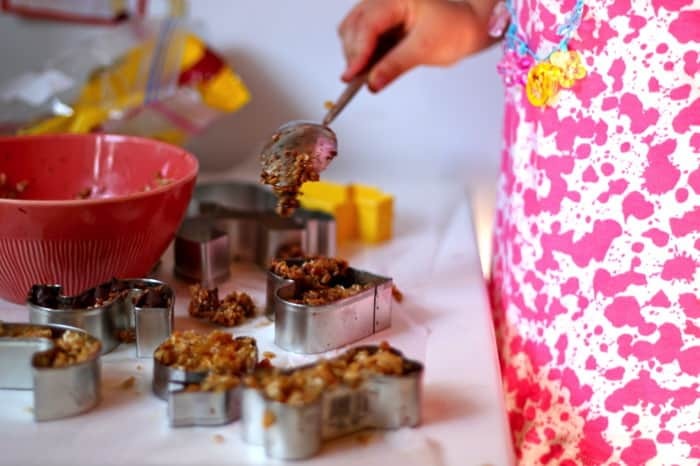 Ok, so now that you’ve got all your bars-combos all figured and in bowls, you just need to cook up some “glue.” You’ll need to do it once or twice to get an eye for the right amount of “glue” to make – if you have too much your bars will be sticky and fall apart. You want to make enough to coat everything and pack it in tight, but not overcoat. But it’s easy to do and you can totally eyeball it. 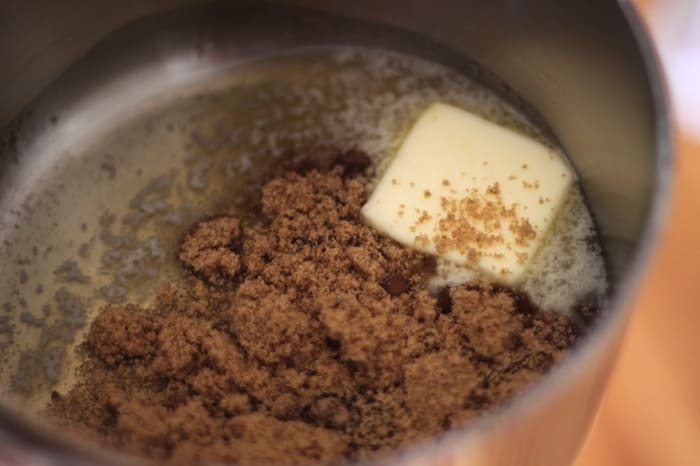 So on the stove mix one part honey, one part brown sugar, half part butter (or even a little less then half a part). 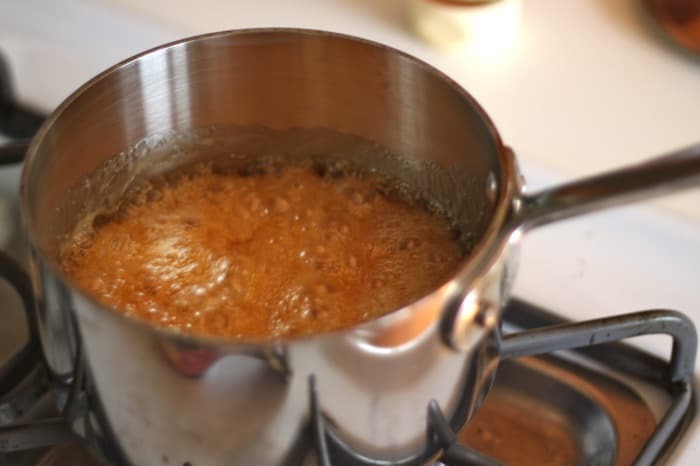 Bring to a foaming boil, lower heat, and cook for a couple minutes (like one to two, not long). Now pour over your “scrap” bowls and stir. Add chocolate chips last. Let them sit to cool and set for a few hours. Remove the cutters and wrap in wax paper to pack in lunches, then eat! I love this idea, can’t wait to try it. Thanks! This ROCKS! We are moving in less than three weeks, so I totally needed this to get rid of all the opened bags of stuff we have in our pantry. THANK YOU THANK YOU! “Kabobos”, how cute! My son used to call them “no-no bars”. These look so yummy. Might have to try it with crumbs from the bottom of the frosted mini wheats box. Yum! Another great idea to try. And speaking of: My first thought this morning when I saw the life-size coffee cup on the front page of the Chicago Tribune Good Eating section, was, “OMG – someone stole Jaime’s idea!” Not to fear, the author credited you and Prudent Baby in the second paragraph! So of course, we had to make those coffee cup coffee cakes again! I yummed all the way to the microwave. 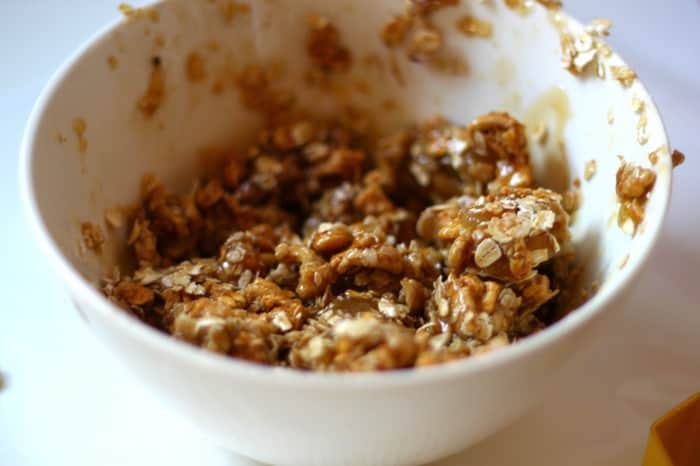 Can anyone recommend how much ‘glue’ to use for about 6-7cups of cereal? I’m totally trying this, but I think I’ll use Agave instead of honey mmmmmm. 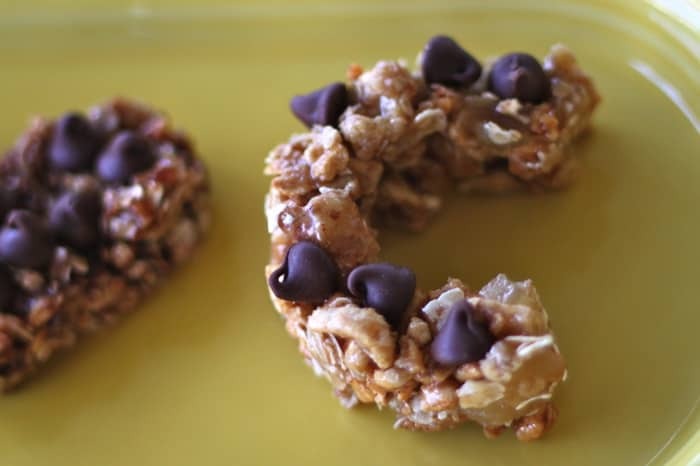 Made these tonight for my gluten-free, dairy-free kid who goes to a nut-free school. Substituted coconut oil for butter and used gf oats and quinoa cereal. Holy yum. So good, it’s a bit evil! Thanks for the recipe! How long do they last for? Should they be refrigerated?